Saturday Night, aka Mystery Project #3, is the first result of an ongoing collaboration with Lauren Abrams. Lauren is the woman behind LaBeana Bags. Her designs are beautiful and she is a joy to work with. The look of the bag is all hers, I’m just the one behind the scenes, translating her art into a knitting pattern. Not that knitting can’t be art, but my role in this project is more of an engineer. I hope you enjoy the pattern as much as I enjoyed helping to create it. And yes, Mystery Project #4 in the sidebar is also a Lauren collaboration. I’ll be shipping her the finished sample this afternoon. Other pattern news: I’ve made two small corrections to the Amy Scarf pattern (fixed a typo in row 17 of the pattern, and deleted an erroneous knit stitch in the instructions for KRL). Please download a new copy! CogKnition posted this on July 6th, 2009 @ 2:08pm in Bags, Knitwear Design, Site Updates | Permalink to "Free Pattern! 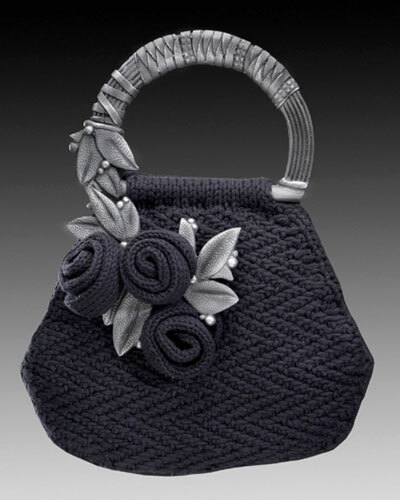 Saturday Night Knitted Purse"